Apollo walking right, holding a laurel-branch, with a small figure standing on his arm (the small figure is not visible); a small stag standing in the right field, ΚΑVΛ to left. A stag standing right with a sapling growing in the right field; ΚΑVΛ retrograde above. Noe F, 84 (same dies). 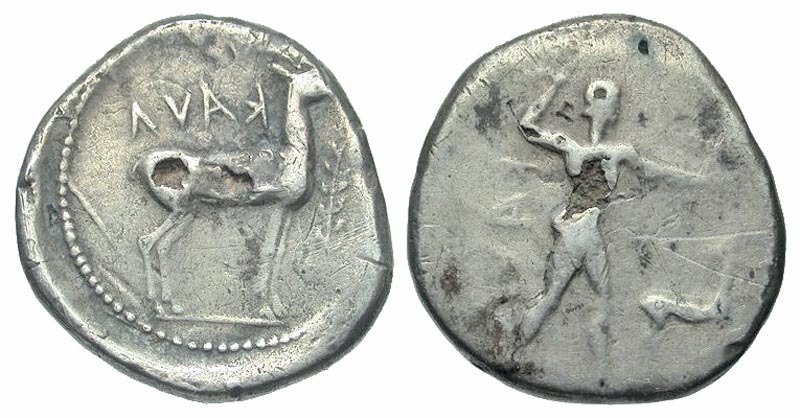 Apollo walking right holding laurel-branch; small figure standing on his arm (the small figure is not visible), stag standing in right field, retrograde ΚΑVΛ to left. Stag standing right; sapling to right, retrograde ΚΑVΛ above. Obv : Apollo standing right, holding laurel branch in right hand, long fillet hanging from extended left arm; symbol behind. Stag standing right; ethnic around. 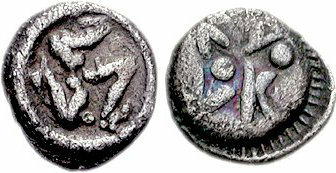 Stag standing right; tree to right, ΚΑVΛ retrograde above in archaic Greek. Apollo Cartharsius standing right, holding lustral branch in right hand, left arm outstretched; stag with head turned back to right, magistrate's mark NAI to left.